What is a missing files host? **Update: We will no longer support FTP publishing in Blogger after May 1, 2010. Learn more on ourdedicated FTP blog. A missing files host specifies an alternate location to look for your files in case there are broken links. To specify the server, go to the Settings | Publishing tab. This is only available if you use the Custom Domain feature. If you choose to specify a missing files host, it will be used as a fallback server whenever someone tries to access a file that cannot be found on your blog. For example, let's say someone clicks a link to www.yourblog.com/foo.jpg but that file doesn't exist. If you have specifiedwww2.yourblog.com as your missing files host, Blogger will automatically look for a file atwww2.yourblog.com/foo.jpg and will try to use that instead. When you select "yes" for this option, a new field will appear where you can enter the appropriate host. All you have to enter here is a subdomain, which is assumed to be on the same domain as your blog. 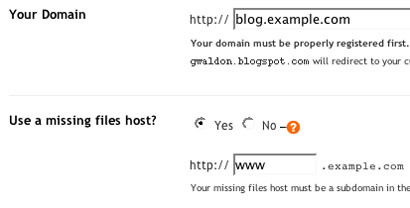 In the example here, both are on the example.com domain, with the blog using blog as a subdomain, and the missing files host using www. Why use a missing files host? This situation may arise if you originally published your blog via FTP and then switched to using custom domain publishing. Images originally posted to your server do not get transferred over to Blogger when you do this, so you may want to move them all to a server such asimages.yourdomain.com and use that as your missing files host.